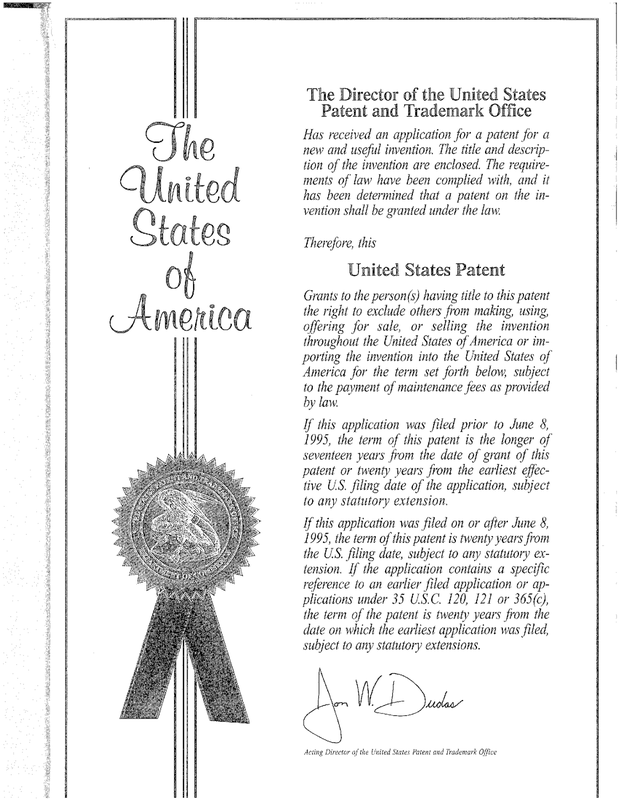 The Kelly Law Firm: What is a Patent? A patent is a grant from the government giving you the exclusive rights to make, use and sell your invention in the United States for up to 20 years. More accurately, a patent allows you the right to exclude others from making, using, and selling your invention. This means that no other person, company or government agency can make your invention or sell your invention within the territories of the United States without your express authority. Additionally, no person, company or agency can even use your invention unless the invention was first purchased from you or your authorized representative. 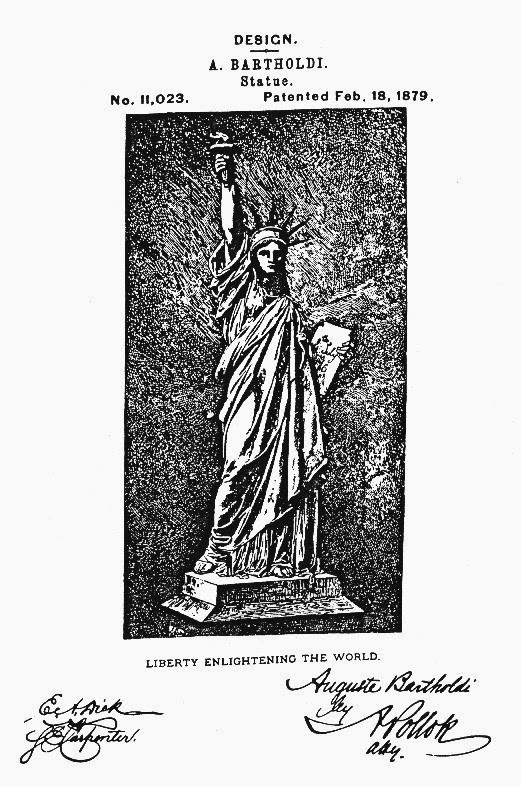 There are 3 types of patents issued by the United States government. Plant patents protect the makers of new types of asexually reproduced plants (plants not grown from seeds). 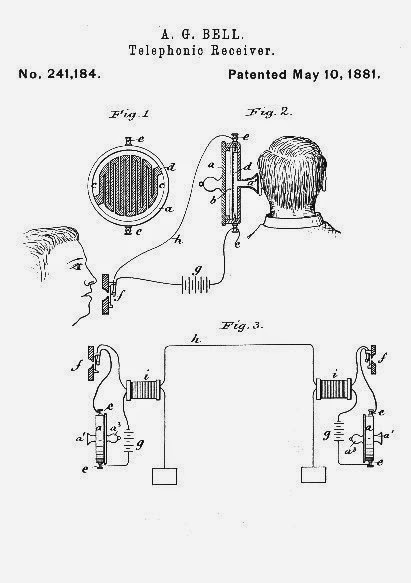 Although most new inventions are patentable, not everything is patentable. Generally to obtain a patent you must invent something that is (1) manmade, (2) tangible, (3) new, (4) useful, (5) not obvious, (6) your own idea, and (7) not used, described or sold in public for more than one year. (See details of each below.) You can obtain a patent for any manufactured article, machine, chemical compound, the process for manufacturing any article, or any improvement to the above. A patentable invention must be manmade. It cannot be found naturally, or be an element of nature. *Example. The person who discovered Uranium could not obtain a patent because Uranium exists in nature and is not manmade. However, a person who creates a machine to mine Uranium or a process to purify Uranium can receive a patent. Patentable inventions must be tangible. Patents cannot be ideas, theories, formulas, ways of conducting business, or other "processes of the mind". Example. Einstein could not receive a patent on his formula E=Mc2. Patents are for new inventions only. If your invention ever existed in the past, it is not patentable now. Example. An archeologist discovers a tool used 1000 years ago; he can not patent that tool. All patentable inventions must have some useful purpose. The aspect of a patentable invention most difficult to judge is obviousness. An invention is patentable only if it is not obvious to a person who is typically educated or trained in the field of the invention. For example, if you invented a new rocket engine, it cannot be considered obvious to a rocket scientist. The most common way to determine if an invention is obvious or not is to search previously patented inventions that are similar to your own invention. 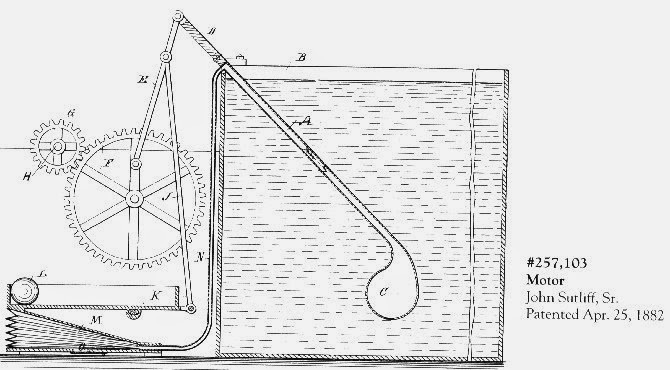 If the other patented inventions are very similar to your own, or if all the elements of your invention are found within the other patents when combined, your invention may be considered obvious. The test for obviousness is NOT when you see another invention and you say to yourself, "It’s so simple why didn't I think of that!" A simple invention is not always an obvious invention. An obvious invention is an invention that has none of its own unique qualities. This is a difficult determination and is best made by a Registered Patent Attorney who is accustomed to making such determinations on obviousness. *Example. You invent a ballpoint pen that has a soft outer surface so that people, who write often, do not develop calluses. Your patent attorney conducts a patent search on your behalf and finds patents for an artist's paint brushes that have a similar soft exterior surface. Although no invention pertains directly to ballpoint pens, your invention may be considered obvious. Patents are for inventors only. If you are not the inventor you cannot obtain a patent. Example. Your son comes home with an invention he made for his science project. You cannot patent that invention, only your son can. 7. NOT USED, DESCRIBED OR SOLD IN PUBLIC FOR MORE THAN 1 YEAR. If you use, sell or describe your invention in public more than one year before you apply for a patent, then your invention is not considered new, and you will not receive a patent. Example. A doctor gives a speech at a convention on January 1, 1990 where she describes a new scalpel she invented. The doctor only has until January 1, 1991 to file a patent application. To obtain a patent you must file an "application" with the U.S. Patent and Trademark Office in Washington D.C. One of the largest misconceptions about obtaining a patent is that a patent application is filed by filling out a series of forms. THERE ARE NO PATENT APPLICATION FORMS!!! There are NO "patent kits" that you can buy in the back of a magazine. There is NO book or government pamphlet that can show you how to write an application. Each and every patent application is different. Many patent applications are hundreds of pages long. Patent applications are very complicated legal documents written in a unique legal language learned ONLY through experience. The Patent and Trademark Office has hundreds of rules controlling the drafting of patent applications, and regardless of your education or your abilities as an author, only a person trained in the art of drafting patents will be able to protect the full scope of your invention. A poorly written patent will result either in a rejected application or a worthless patent that is easily overcome or bypassed by a competitor. To obtain a patent, you should take your idea for an invention to a Registered Patent Attorney. That attorney will have a technical background and will work with you, showing you uses and variations on your invention that you probably never imagined. Your patent attorney will provide you with a strong, valuable patent that will protect every possible variation of your invention. Contrary to popular belief, you do NOT need a model. In fact the vast majority of patents today are granted to inventors that have only thought of good ideas, and never actually made the invention. All you need to know to obtain a patent is the knowledge of exactly how your invention works. Your knowledge of your invention must be detailed enough so that you can fully describe how to make and use your invention in your patent application. Someone should be able to make and use your invention simply by reading your patent application. Once you have filed your application with the Patent and Trademark Office, your application receives a 'Patent Pending' status. Your application, within the patent office, gets assigned to an Examiner who specializes in the field of your invention. (i.e., If you invented a new type of screwdriver, your application will be assigned to the Examiner who inspects applications just for screw drivers and like devices.) This system ensures that the Examiner evaluating your application is familiar with all the other inventions in the same field as yours, and can make a quick and efficient determination regarding the patentability of your design. If your patent is within a popular field, there may be a large number of applications pending on the desks of Examiners. Some Examiners have a backlog of work anywhere between 6 months to 2 years; consequently, your application will remain pending for that time. Once examined, the Examiner will approve, reject or partially reject your application. If your application is not approved, your application may be amended by your patent attorney to meet the requirements of the Examiner. Patents only last for a specific time. (E.g. 20 years for a utility patent.) It is while your patent application is pending that you should prepare for the approval of your patent, either by finding companies interested in leasing your patent or by preparing markets for your own sale of your invention. By preparing early, you will utilize the full life of your patent, not wasting the first few years of your patent's life trying to find a company interested in buying your patent rights. SHOULD I GET A PATENT FOR MY INVENTION? Obviously, you do not need a patent to use or sell an invention you have invented. However, if you do not obtain a patent, ANYONE can take your invention, make it, sell it, and profit from it. If you do not think that the sole right to make, use and sell you invention is worth money, than you should not spend your money obtaining a patent. If you think that a market does exist for your invention, you must then compare the cost of obtaining a patent, against the potential value of your patent. Some patents are worth millions of dollars, some are worthless. Only you know the potential of your invention. If you obtain a patent, it will only be worth having if you can find a profitable market for your invention, gain an advantage over your competition, or sell or lease your patent rights to another for a profitable royalty. EXAMPLE. You just patented a new windshield wiper system for a car. You do not want to go into the car-part business yourself so you lease some of your patent rights to G.M. and Ford. G.M. and Ford would pay you a royalty for each car they produce with your invention. If this example were true, you would be making over 10 million dollars a year from your invention if you received only a $0.50 royalty for your invention. If you have decided that you want a patent for your invention, the first thing you must do is search your patent to be sure you are the first person to invent it. Remember that only a small percentage of inventions have ever been mass produced, and the fact that you have never seen your invention before DOES NOT ENSURE that it has never been invented. However, if you have faith that you are the first person to think of your invention then you may decide not to search your invention and proceed directly with filing your patent application. You must remember that it only costs a few hundred dollars to professionally search a patent. Therefore, finding out if your invention is new will save you the larger cost of actually filing a patent application and having that application rejected for being previously invented or an obvious variation of an existing invention. Although you may conduct your own patent search by traveling to the Patent and Trademark Office in Washington D.C., most people opt to have their patent attorney search their invention on their behalf. (It's usually cheaper than traveling to Washington themselves.) Most Patent attorneys either have associates in Washington D.C. or make regular trips to the Patent office to conduct searches for their clients. There are 6 million U.S. patents, 12 million foreign patents, 150,000 technical books, and over 120,000 bound volumes of periodicals on file in the Patent Office. All the information being stored in one of over 350 patent classes divided into over 250,000 subclasses. Your patent attorney will know how to search your invention and will be able to evaluate the patents that are found to be close to your invention. The expertise of your patent attorney, evaluating patents during a search, will well justify the fee, and you can be assured that your invention was searched properly and stands a good chance of obtaining a patent. WILL MY INVENTION BE KEPT SECRET? When you take your invention to a patent attorney, any information you reveal about your invention is privileged and will never be disclosed. Similarly, when you file your application with the Patent Office, your application is kept secret until it actually issues into a patent. If your application is rejected or abandoned, the Patent Office will destroy its records and your invention will remain in secrecy. However, if you obtain a patent, your invention always becomes public knowledge. If you want your invention to remain a secret forever, you should not obtain a patent.